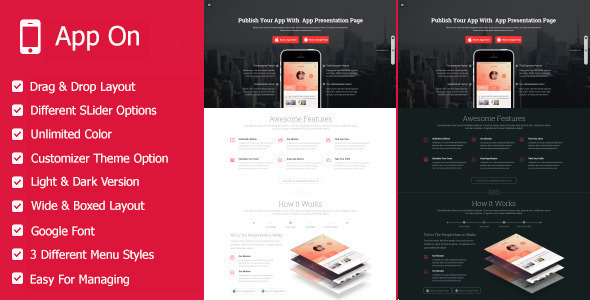 Here is a marvelous way to launch your web application, get the all-new App on – Responsive App Landing WordPress Theme, a tailored web page template to suit App Launch, Product promotion, Landing Page and any other marketing campaigns. App on Responsive App Landing WP theme is highly extolled on account of incredible design quality and customizability. It is fully responsive and well documented. Besides, it has got an average rating of 4.5 stars, which shows its popularity and effectiveness. Stop experimenting and go for the best, buy App on – Responsive App Landing WordPress Theme, an answer to all your needs.